1510 – The first written record of a decorated Christmas Tree comes from Riga, Latvia. Men of the local merchants' guild decorated a tree with artificial roses, danced around it in the marketplace and then set fire to it. The rose was used for many year and is considered to be a symbol for the Virgin Mary. 1530 – There is record from Alsace, France (then Germany territory) that trees were sold in the marketplace and brought home and set up undecorated. Laws limited the size to "8 shoe lengths" (slightly over 4 feet). 1600s – By the 17th century, it was common in Germany to decorate Christmas Trees with apples. This practice was a holdover from the 14th and 15th centuries when evergreen boughs hung with apples were the only prop used in the "miracle plays" that were performed at the churches on December 24. December 24 was Adam & Eve's Day in the early Christian calendar, and the plays were used as ways of teaching the Bible to a largely illiterate population. 1700s – In parts of Austria and Germany, evergreen tips were brought into the home and hung top down from the ceiling. They were often decorated with apples, gilded nuts and red paper strips. Edible ornaments became so popular on Christmas Trees that they were often called "sugartrees." The first accounts of using lighted candles as decorations on Christmas Trees come from France in the 18th century. 1853 – Franklin Pierce is credited with bringing the first Christmas Tree to the White House. Late 1800s – The first glass ornaments were introduced into the United States, again from Germany. The first ones were mostly balls, but later chains of balls, toys and figures became more common. 1900s – Due to overharvesting, the natural supply of evergreens began to be decimated. Conservationists became alarmed, and many magazines began to encourage people to substitute an artificial "snow" covered tree, consisting of a branch of a deciduous tree wrapped in cotton. 1901 – The first Christmas Tree farm was started in 1901 when W.V. 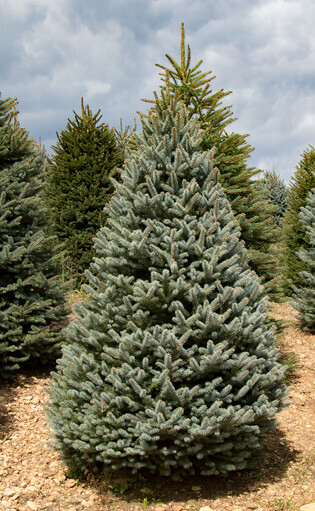 McGalliard planted 25,000 Norway spruce on his farm in New Jersey. Also in 1901, Theodore Roosevelt tried to stop the practice of having Christmas Trees out of concern about the destruction of forests. His two sons didn't agree and enlisted the help of conservationist Gifford Pinchot to persuade the president that, done properly, the practice was not harmful to the forests. For a history of the Christmas tree industry in North Carolina visit the NCSU Extension Christmas Tree Program.